Just before the new year my sister and I left the Game store without the cover for her new DS we'd gone in for on account of people packing the shop shoulder-shoulder. Instead I bought a ball of yarn and some dpns and set about making this before the end of the year. 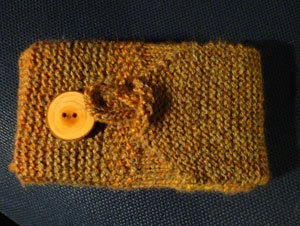 I didn't quite make it, I cast off the next morning, and the button still has to be sewn on, but it's soft and no-one has one like it!